Tākina mai rā te huihuika o Matariki, o Puaka, o Tautoru, o Takurua. Ko Puaka ki ruka hai tohu o te wā, kia rite ai kā tākata. Kia whakakau ake a Matariki ka pānuitia ia whetū e taea ai te matapae i te tau e tū mai nei. He wā hoki kia poroporoaki ai te huka mate o te tau ka huri. Tērā a Pōhutukawa he pae whakamahara mō aku tau kahuraki. Kua kohia kā tipu kia tāpaea ki a Matariki. Ko te manaaki, ko te atawhai i te taiao ētahi kaupapa nui mō te whakanui i a Matariki kia whakamanawatia te whenua me te wai. Tērā a Waitī, a Waitā, a Waipuna-ā-raki, a Tupuāraki, a Tupuānuku, a Ururaki, kia mahara hoki tātou ki te tiaki i te ao tūroa, mō tātou ā mō kā uri ā muri ake nei. Tērā hoki a Hiwaiteraki hai awhero o kā wawata. Horahia nuitia mai kā hua tuawhiti mātinitini o te tau. For centuries, people across the world have observed the rising and setting of stars as indicators of seasonal change and prosperity. In Aotearoa New Zealand the helical rising of the constellations Matariki (Pleiades) and Tautoru (Orion), and the stars Puaka (Rigel) and Takurua (Sirius), represents this transformation. When Puaka is suspended above here in the South, we know it is time to prepare for the cyclical adjustment. When Matariki rises, an insight can be acquired into the season ahead. It is also a time of reflection and to farewell those who have passed on. Pōhutukawa (Sterope) is the star that reminds us of our treasured ones that have gone. Matariki signifies our connection to the environment and our food resources. Traditionally, food was cooked and offered to the star cluster, reminding us to respect and care for the natural world, so that future generations may enjoy the same quality of life we cherish. 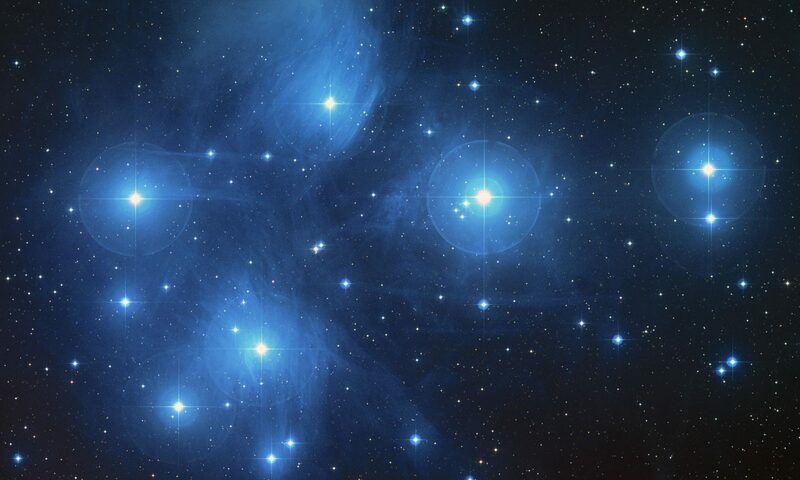 The stars of Matariki hold dominion over particular areas of our environment: Waitī (Maia) – fresh water; Waitā (Taygeta) – the sea; Waipuna-ā-raki (Electra) – the rain; Tupuānuku (Pleione) – everything that grows within soil; Tupuāraki (Atlas) – everything that grows above ground, and Ururaki (Merope) – the winds. There is also Hiwaiteraki (Calæno), the star associated with granting our wishes and realising our aspirations for the coming year. Let us be favoured by the multitude of immense opportunities. In Ōtepoti Dunedin we celebrate Puaka Matariki, the Māori New Year, through a diverse citywide programme of community events. Puaka Matariki is the time when we come together to share stories, pass on knowledge and learning, remember the dear departed, and plan for the year ahead. Communities will gather to celebrate the season at shared feasts, fun and educational programmes will be presented by public institutions such as our Museums and Art Galleries and our environmental groups, and we will also celebrate Puaka Matariki through a wide range of Mātauraka Māori science lectures and Toi Māori visual arts, music and dance performance events. In 2019, Matariki sets on 27 May and rises on 25 June. This year, the Dunedin Puaka Matariki Festival will be celebrated from Tuesday 25 June to Tuesday 9 July. This period straddles the end of the second term and the beginning of the midyear school holidays, so you can expect to see a galaxy of family-friendly, mātauraka Māori, Toi Māori, and collaborative art-science events on the Festival programme. Join us in celebrating the midwinter season of wānaka (learning) and whanaukataka (community spirit). Nau mai, tautimai – everyone is welcome! Event organisers will be advised if they have received funding by Friday 17 May 2019. The Puaka Matariki Steering Roopū is a group of volunteers who take a kaitiaki role to support the Dunedin Puaka Matariki Festival. We are not paid and we do not represent any one group, though individually we belong to many other community groups. We meet about once a month while the Festival programme is being planned and taking place. Our purpose is to tautoko Puaka Matariki Festival events by providing helpful information and support when appropriate and when invited to do so. Some of the ways we can help is to advise about funding applications to the Dunedin City Council (DCC) and other organisations such as Creative New Zealand, act as a ‘sounding board’ for new event ideas, and help make links between the different events. We also provide advice and support to the Puaka Matariki Festival Coordinator and DCC staff involved in organising the Festival. How did the Puaka Matariki Steering Roopū come about? There have been many volunteers in this roopū over the past years, all supporting the original aim – to assist individual events to secure funding. A decade-or-so ago, as the Festival grew, we presented a paper to the DCC’s Annual Plan that strongly supported the civic funding of Puaka Matariki Events. In 2008/2009 the DCC agreed to fund a coordinator and put some funds aside specifically for delivering Puaka Matariki events. This was the start of the festival structure that we see today. We have had five coordinators to date, namely Reitu Cassidy (2009), Gina Huakau (2010/11), Josh Thomas (2012/13), Antony Deaker (2014/15/16), and Vicki Lenihan (2017/18). At the end of 2018 the DCC created a new part-time Community Events Advisor – Cultural role, of which the coordinating the Dunedin Puaka Matariki Festival is a major component. the current Festival Coordinator, Vicki Lenihan at puakamatariki@gmail.com.